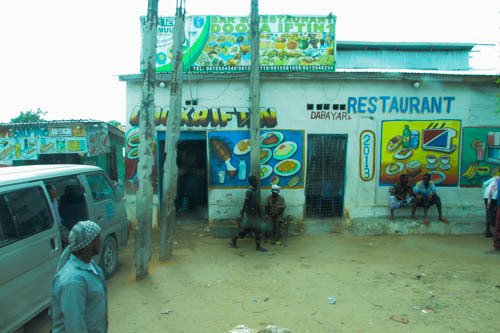 If I expected subdued or morose when I arrived in Mogadishu, or imagined that for Somalis life was a tough war-ravaged event to survive through gritted teeth, it was yet another preconceived idea that was very quickly dispelled. Whereas in many other Muslim countries, I’ve seen women cloaked in black and resolutely avoiding any eye contact with anyone, here the swathes of fabric covering their modesty could not be more vivid. Fuscias, lemon yellows, bright greens flash past confidently as I make my way down shopping streets. And far from averting their eyes, I’m greeted with beaming smiles and waves. Primary school children bob down the street in apple green shirts with their beige shorts, competing for attention with those from the secondary classes, in their canary yellow smocks and headscarves. Buildings join the rainbow with walls of one house clashing furiously with its neighbour. Trucks carrying charcoal and straw are not immune; with their slats painted every shade of pink and purple. Illiteracy gives shop-keepers a worthy reason to get the paint brushes out. They’ve devised an ingenious and artistic way to advertise their wares to passers-by unable to read. Plastered across the walls either side of their entrances are large elaborate cartoon-like drawings of the items that can be found on the shelves inside. So the streets become one long picture book; burgers depicting snack bars, an open mouth with tongue sticking out directing you to the dentist, hand-drawn computers – a technical shop and a haphazard selection of squiggly-shaped women’s footwear – a fashionable shoe shop. The aim of the bright billowing gowns may be to conceal. Their effect is an African celebration. The aim of the childlike drawings along every wall may be to entice and inform. Their effect is to draw the eye away from the pockmarks in the cement and bring vibrant hues to the dusty streets and remnants of buildings torn apart by years of bloody war. They shout out in big bold print, that cracks no matter how traumatic, can be painted over. And as long as they can draw it, they’ll be selling it on the streets of Mogadishu. 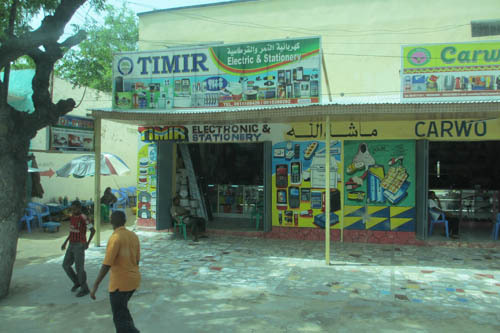 This entry was posted in Somalia and tagged adventure, Africa, colour, conflict, Mogadishu, shops, Somalia, war. Bookmark the permalink.